Montage of 2 satellite images taken at different times. 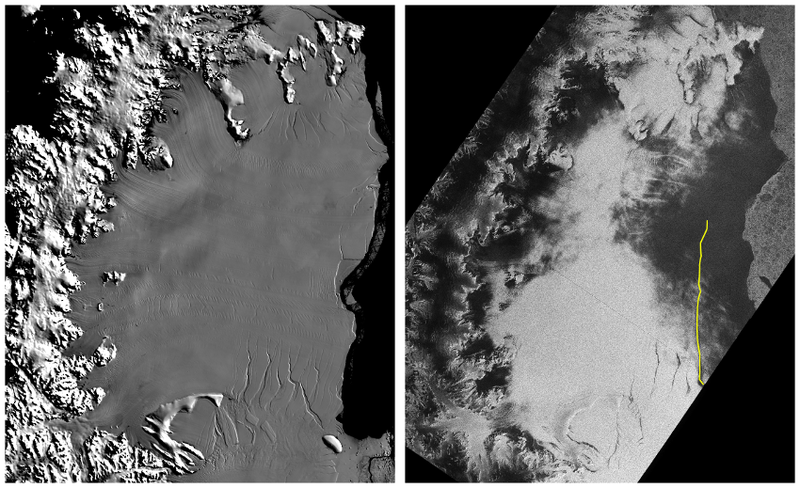 Left: subset of Modis Mosaic of Antarctica, 2003/4. Right: Sentinel 1A, 2017-02-06. MODIS image was acquired in the optical (red) part of the spectrum, while the Sentinel image was acquired using radar. The yellow line shows the approximate length of the rift on 6 Feb 2017. Detail showing the origin of the rift. Left: Modis Mosaic of Antarctica, 2003/4. Left: Sentinel 1A, 2017-02-06. Note the eastward displacement of the surface feature marked in a black square. This is the result of the normal movement of the ice shelf. The displacement is about 8800 m, which gives a (very) crude estimation of the ice velocity of about ~ 680 m per year. The rift developed from the chasm marked in a red square. If things proceed as usual this rift will continue to open northwards until the external portion of the ice shelf will separate and become an iceberg. We call this process iceberg calving. Ice shelves are floating parts of ice sheets, attached either to land or to ice sheets themselves. Ice sheets resting on land, as those in Antarctica and Greenland, flow towards the ocean by a combination of internal (shear) deformation of the ice, basal sliding, and basal sediment deformation. As an ice sheet reaches the ocean the ice may start to float. As it losses contact with the base, the basal shear becomes almost zero and shear extension, that is stretching, becomes the dominant flow mechanism. 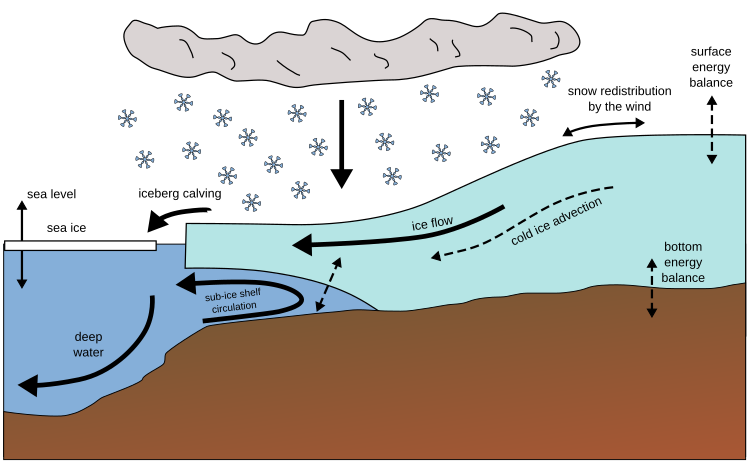 Conceptual diagram of an ice sheet – ice stream – ice shelf system. Given the right conditions, such as the presence of an embayment that provides lateral constraint and protects the ice shelves from the destructive forces of waves and tides, ice shelves can grow large and become stable features. Ice shelves spread then by extension, flowing towards the open, unconstrained side facing the ocean, becoming thinner and mechanically weaker towards the front. As they slowly extend beyond their protective bays, ice shelves may from time to time release an iceberg off their fronts. This process is natural and can have recurrence times of the order of decades. In a “normal” world (one without anthropogenic climate warming at the scale and rate we are witnessing now) this phenomenon is spectacular but signals no impending danger for an ice shelf. 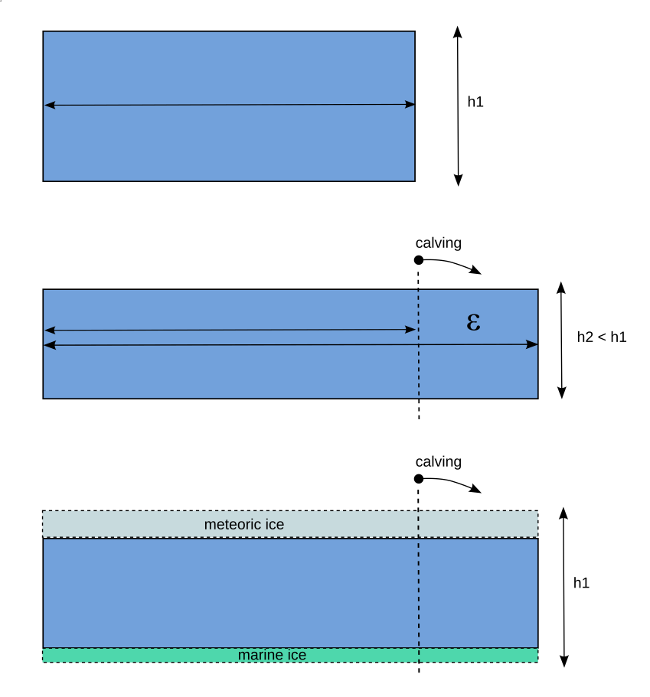 Conceptual diagram of the mass balance and mechanics of an ice shelf. Enter climate change. Ice shelves are extensive and relatively flat surfaces lying roughly at sea level. Accordingly, changes in climate affect them almost in its entirety and almost instantaneously. As the Earth’s polar climates warm, existing ice shelves are exposed to conditions under which these cannot survive. An ice shelf under a warming climate might suddenly find itself in the ablation zone, the area where the surface mass balance of a glacier is negative. This is bad news for ice shelves because in such conditions they will not be able to compensate the thickness reduction due to its extensive flow. This makes the ice shelf thinner and mechanically more fragile with time. In addition, since ice shelves are essentially flat and have no developed drainage system, excess melt water from the increasingly warmer summers can accumulate in the surface and penetrate to the cold interior, where it will freeze and expand, further debilitating the ice shelf. When this process happens almost every summer during several years, a former healthy and mighty ice shelf will become irreversibly unstable. At this point, any external perturbation, such a Föhn storm, that in another circumstances would not have influenced the shelf much, will now provide the final trigger for the collapse. This is exactly what happened in Larsen A and B. The collapse of an ice shelf does not in principle affect sea level because ice shelves are already floating, and they have already displaced the volume of water their submerged parts occupy. There is however a secondary effect of the removal of ice shelves that actually impacts in sea level, namely the enhanced flow of its tributary glaciers. In the case of Larsen C this secondary effect will likely not impact so much (some decimeters at most), but it would be huge in case of the collapse of any of the two giant ice shelves Ross and Filchner/Ronne ice shelves. Those were already many words inspired by a rift on an ice shelf! Let’s keep an eye on Larsen C, it might give us a surprise in the near future. De Angelis, H. and Skvarca, P., 2003. Glacier surge after ice shelf collapse. Science, 299(5612), pp.1560-1562. Jansen, D. , Helm, V. , Neckel, N. , Luckman, A. J. and Bevan, S. (2016): Observed rift propagation in the Larsen C Ice Shelf from Sentinel 1-A radar data, EGU General Assembly 2016, Vienna, Austria, 17 April 2016 – 22 April 2016 . Skvarca, P. and De Angelis, H., 2003. Impact assessment of regional climatic warming on glaciers and ice shelves of the northeastern Antarctic Peninsula. Antarctic Peninsula Climate Variability: Historical and Paleoenvironmental Perspectives, pp.69-78. Thank you, Hernan. Great description and visuals. As I cannot find an appropriate comments section on your blog, I thought I’d just drop a message in here. I thank you kindly for your follow at naturestimeline, it is much appreciated.